On 20 June, we were invited to appear in the opening ceremonies for Italian Week, at the Italian Cultural Centre. Soprano Mariana Valdés, tenor Andrzej Jeziorski, and City Opera staff pianist Greg Caisley were joined by producer-narrator Tom Durrie in a programme of Verdi, Rossini, Puccini, Donizetti, Cilea, di Capua, and De Curtis. Their work was exceptionally well-received. Photos of the happy occasion may be seen on our FaceBook page. 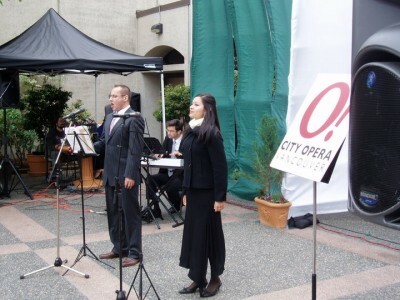 This is all part of City Opera’s continuing outreach into the greater community. Opera belongs everywhere.